The Indian government had touted the listing of Pakistan-based terror groups as a diplomatic victory in 2017. New Delhi: A year after India had termed the introduction of this norm as a diplomatic victory, the tenth BRICS summit in South Africa dropped the specific naming of terror groups from the joint declaration. 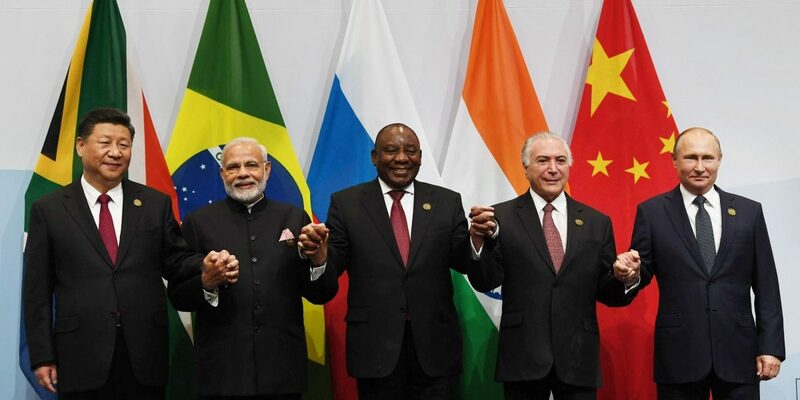 The leaders of India, China, Brazil, South Africa and Russia met in Johannesburg on Thursday for the tenth edition of the annual summit of the bloc of emerging powers. The joint declaration issued at the end of the summit had an extensive section on the combating terrorism. The language was largely similar to the declaration released at the 2017 summit in China’s Xiamen, but with a major difference – there was no mention of specific terror groups. The Indian government had specifically touted the listing of the Pakistan-based terror groups as a diplomatic victory. “For the first time you would notice, there has been such specific listing of such terror organisations and the fact that BRICS countries should work together in facilitating listing of these under UNSC,” said MEA secretary Preeti Saran at the post-summit press conference in September 2017. Indian officials had claimed that China’s endorsement of the declaration last year made it imperative on Beijing to support the listing of terrorists like Jaish-e-Mohammad’s Masood Azhar. China’s ‘hold’ on the listing of Masood Azhar by the UN Security Council 1267 sanctions committee continues. The Xiamen declaration was actually not even the first time that LeT and JeM had been named in a multilateral document that was certified by China. The Amritsar Declaration at the 2016 Ministerial Conference of the Heart of Asia expressed concern over the “the gravity of the security situation in Afghanistan in particular and the region and the high level of violence caused by the Taliban, terrorist groups including ISIL/DAISH and its affiliates, the Haqqani Network, Al Qaida, Islamic Movement of Uzbekistan, East Turkistan Islamic Movement, Lashkar-e-Tayyaba, Jaish-e-Mohammad, TTP, Jamaat-ul-Ahrar, Jundullah and other foreign terrorist fighters”. Meanwhile, South African media groups News24 and Daily Maverick reported that South Africa had to rush a senior minister to New Delhi last week in order to ensure the presence of Prime Minister Narendra Modi at the BRICS summit. In June, the Muslim Lawyers Association and South African Kashmiri Action Group had petitioned South Africa’s National Prosecuting Authority (NPA) to arrest Modi on arrival for alleged human rights violation in Jammu and Kashmir. Last week, the NPA declined to issue a warrant for the Indian prime minister on the grounds of “inadequate evidence to sustain a successful prosecution”. According to News24, Modi had nearly snubbed the summit after the NPA had written a letter to the Indian government, saying that they were looking into the petition filed by the Muslim Lawyers Association. “Energy Minister Jeff Radebe was dispatched to India last week to smooth over the cracks and to explain the NPA’s decision not to prosecute,” said the article. Quoting an anonymous South African official, the report noted that the Indian prime minister could not have been charged and arrested in the first place “as he was protected by the Geneva Convention governing international summit”. There was no response from the Ministry of External Affairs on the media reports about diplomatic efforts made by South Africa to salvage the BRICS summit by dispatching a senior minister to New Delhi.